Many things can cause low immunity: From the environment, to our lifestyle choices and even genetics. Stress, for instance completely depletes immunity. In college, I remember getting sick almost weekly due to the stress of lack of sleep, and excessive studying (not to mention the partying which lowered my immunity for other reasons!). But many of us can recall a time when we were very stressed or overwhelmed and it resulted in illness. Excessive antibiotic use, hospitalizations, smoking, poor diet, food allergies and even over-exercising can also cause us to have a less than robust immune system. 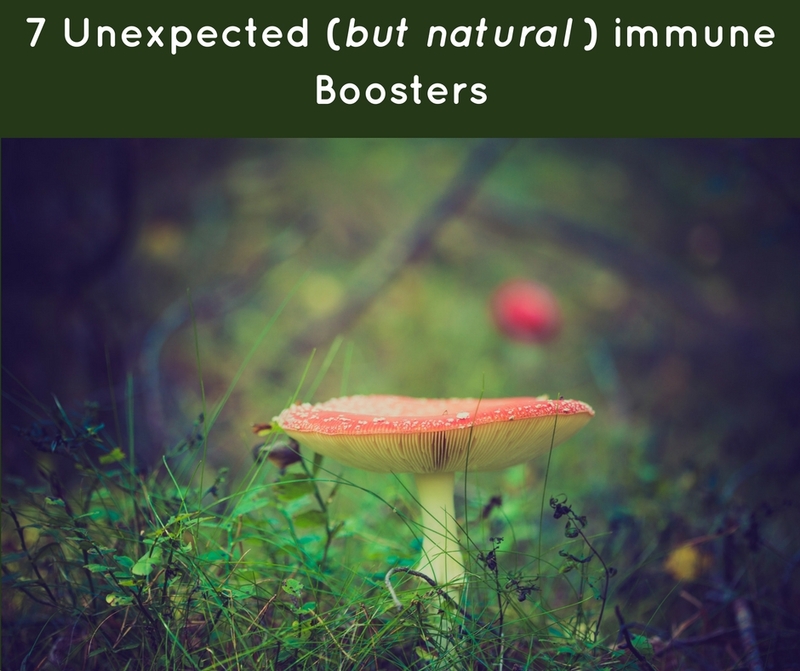 The 7 immunity boosters outlined below may be a bit more unexpected than the suggestions you would normally receive (vitamin C, echinacea, turmeric etc) but have been studied and used for years as a means to increase health and reduce chronic illness. This article does not discuss other behavioral and lifestyle changes one can implement as well such as yoga, meditation, macro-nutrient balanced foods, good water quality, and checking for environmental toxins in the home etc, but should be used concurrently with any supplements you may decide to take. Note: Only you know what is right for your body. I am not a physician and one should consult a MD if you are concerned about using a new supplement, even a natural one. I do not recommend any one of these over another, per se, but suggest using your own inner dietician to determine what is best for your body and lifestyle. This is a Chinese herb used for thousands of years for immune enhancement. Astragaus can help protect the body against common physical, mental, or emotional stress. Astragalus has antibacterial and anti-inflammatory properties as well. In addition, research has shown that astragalus has antiviral properties and stimulates the immune system, which suggests that it can be useful to prevent colds. For more information about Astraulus, click here! Miso and its derivatives like miso soup is a fermented food which is known to support your microbiome and gut health. Miso also has properties in it that can quickly convert your PH balance from acidic to alkaline and can calm the nervous system down. Less stress in the nervous system = less illness. Meant for short time use, oregano oil is extracted from the common garden herb. It has anti-viral, anti-fungal and powerful antibacterial properties that can be useful in preventing or reducing the severity of a cold or flu. Its safe to use on your skin for common ailments like cold sores, and joint pain but because its so strong, its best to dilute it with a carrier oil such as olive oil. Oh and by the way, it can also be used as an insect repellent! Oregano oil for the win! Zika be gone! Read this article which suggests Oregano oil can be even more effective than antibiotics! Propolis, also known as “bee glue” is made from the secretion of bees. It boasts over 300 medicinal compounds in it and is even being researched to combat certain cancers. Packed with anti-viral and anti-bacterial properties, this glue can also be used topically for wound healing, and for fighting infections of all kinds. You can buy propolis in liquid form and use in the back of your throat when you have a sore throat. Related Post: But, I DESERVE that brownie! Also known as “Arctic Root” Rhodiola is an herb that is found in the arctic areas of Europe and Asia. Its known as a fatigue fighter and is also considered an adaptogen, which is a substance that can help the body adapt to stress without competing with normal, natural bodily functions. Rhodiola strengthens and enhances the immune system by helping to keep homeostasis in the body. Rhodila can be purchased in the form of a pill, and is widely available online. Elderberry, which is a member of the honeysuckle family, has vital anti-viral and antibiotic properties in it. While it’s not recommended to eat raw, you can purchase the extract of these berries which have been cooked and then gently extracted and made available in health food stores for use. Elderberry use has been around for generations as a folk remedy but it wasn’t until the 80’s and 90’s when it became more widely used medicinally. High in antioxidants, bioflavinoids and other proteins, it can destroy the ability for cold and flu viruses to infect the healthy cell. Consider this research finding, from the Bundesforschungsanstalt research center for food in Karlsruhe, Germany, originally published in (www.herbwisdom.com): “Scientists conducting studies on Elderberry showed that elderberry anthocyanins enhance immune function by boosting the production of cytokines. These unique proteins act as messengers in the immune system to help regulate immune response, thus helping to defend the body against disease. Further research indicated that anthocyanins found in elderberries possess appreciably more antioxidant capacity than either vitamin E or vitamin C.” Sounds like a pretty compelling case to me to use. Particularly, Reishi, shitake, cordyceps, and maitake. Mushrooms seems to be one of those foods that people either love or hate! Maybe it’s the texture or the earthiness and umami flavor that either excites you or makes you want to retch – but the research is clear that consuming them can be very beneficial for your health in many ways. I could list the ways and the various mushrooms with each benefit, but I couldn’t do it justice the way this comprehensive article covers it. This article is pretty fab too. What are some more holistic strategies you use to enhance your immunity, health and overall well being? I’d love to hear in the comments section! Would you like to know all the best ingredients to stock up on for the essential healthy pantry? Click below and instantly receive your Healthy Pantry Essentials checklist today! I want my Healthy Pantry Checklist!